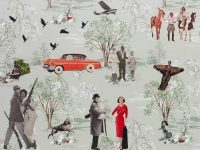 Gavin Brown‘s enterprise, the perennially hip downtown art gallery, recently announced it would be moving to Amsterdam Ave. and 126th Street, adjacent to Columbia University’s new Manhattanville campus and a stone’s throw from Gavin Brown’s own Harlem townhouse. 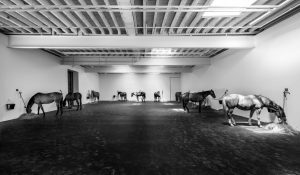 But before closing his far West Village space this past weekend, the dealer re-created Jannis Kounellis’s legendary Untitled (12 Horses), first executed in Rome in 1969. 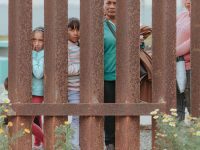 Though the piece has been re-installed a handful of times since, this was the first time it has been shown in North America. 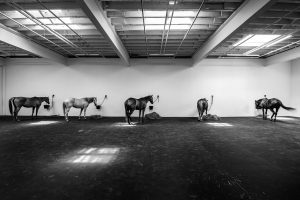 The work comprises, as its parenthetic title suggests, 12 horses tethered to the gallery walls. The Greek-born artist Kounellis was part of the post-Minimalist movement in Italy known as Arte Povera (literally ‘poor art’) that created happenings and sculpture from everyday materials, breaking down the traditional dichotomy between art and life. 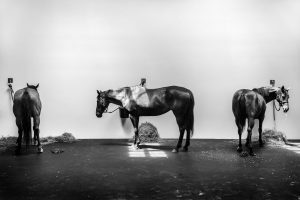 Over 45 years later, the piece still has the ability to disturb; and the presence of these powerful yet tranquil animals transformed the predictable space of the commercial art gallery into an equine sanctuary. In an establishment known for its social and even raucous atmosphere, the only occasional noises came from the horses. 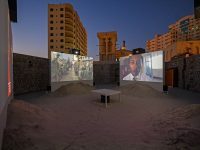 Concurrent with the installation, Rirkrit Tiravanija, whose practice also involves commonplace materials, served free tacos made with pork roasted in a pit in the floor. With three levels of exhibition space in its new Harlem location, Gavin Brown’s enterprise will surely continue to attract collectors, artists, and the general public alike. 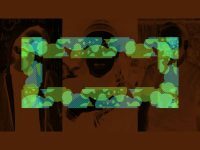 But if you aren’t willing to make the trek uptown this fall, the gallery will be keeping its Chinatown outpost at 291 Grand Street. It’s the best of both worlds.